A woman came down with a serious ailment recently -- and it was all caused by a hair tie. A woman in Kentucky faced a life-threatening condition recently — and it was all caused by a hair tie. Audree Kopp noticed a bump on her wrist as she was moving into her new home about two weeks ago, and it continued to grow in size and become redder and more painful, according to a WLKY report. She went to the doctor and was prescribed antibiotics, but it seemed to do nothing to the bump, prompting her to get emergency surgery. As a result, she only narrowly avoided a potentially deadly bout with sepsis. Doctors found a huge abscess on the back of her wrist, and the puss had to be drained. They think the bacteria came from a hair tie that Kopp wore around her wrist that eventually got through the pores and hair follicles, causing an infection. And it could happen to you. Kopp was amazed, thinking it came from a spider bite, never guessing it was a glittery little hair tie around her wrist that was the culprit. She now pledges never to wear them again, according to WLKY. 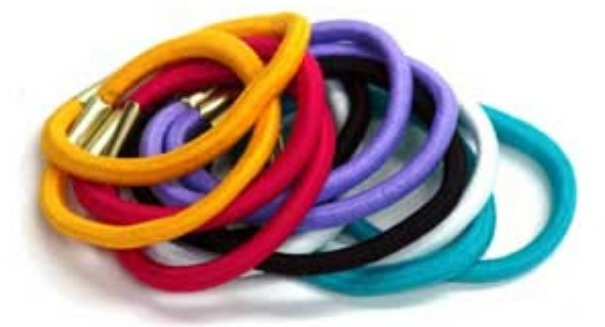 People often put hair ties around their wrists for convenience or fashion — or both — not realizing all the bacteria and germs that they can carry, or at least not realizing that the bacteria can find a way to burrow into your skin. As a result, maybe it’s best to wear your hair ties in your hair, or not at all.